According to a new report Europe Smart Watch Market, published by KBV Research, the European Smart Watch market is expected to attain a market size of $6.9 billion by 2022, growing at a CAGR of 21.4% during the forecast period. 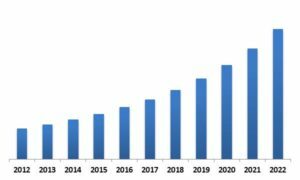 Europe Smart Watch Market Revenue Trend, 2012-2022 ( In USD Billion)[/caption] The Germany market dominated the Europe Extension Smart Watch Market by Country in 2015, and would continue to be a dominant market till 2022; thereby, achieving a market value of $1,015.7 million by 2022, growing at a CAGR of 19.5% during the forecast period. The France market is expected to witness a CAGR of 19.8% during (2016 - 2022). Europe Smart Watch Market Growth Trend, 2013-2022 The Personal Assistance market dominated the European Smart Watch Market by Application in 2015, and would continue to be a dominant market till 2022, growing at a CAGR of 19.7 % during the forecast period. The Watch OS market dominated the Europe Smart Watch Market by OS Type in 2015. Android is the most popular of the OS platforms for Smart Watches. The Android market is expected to witness a CAGR of 22.2% during (2016 - 2022). 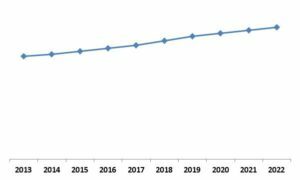 Europe Smart Watch Market Revenue Share by Country, 2012 - 2022 (in USD Million) The report has exhaustive quantitative insights providing a clear picture of the market potential in various segments across the countries in Europe.